Chamomilla matricaria (Cham.) 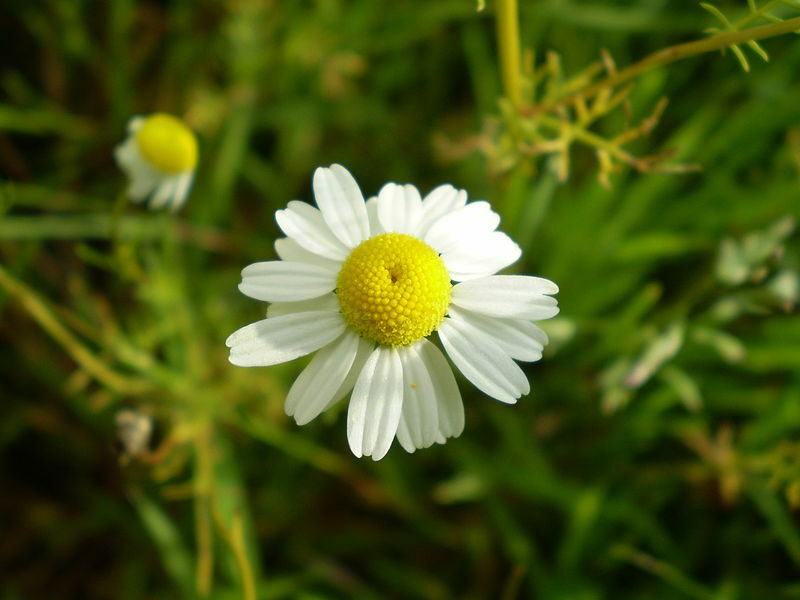 is a plant with small daisy-like flowers native to Europe and temperate Asia. It is now grown in most parts of the world. Chamomilla is used by hebalists and homeopaths as a gentle sleep aid and for digestive complaints. Its effect is homeopathic even when used in raw herbal form (when taken in excess it produces symptoms similar to those it treats). When used in homeopathic potencies Chamomilla treats a larger range of physical symptoms and mental-emotional symptoms arising from irritability and increased sensitivity to external stimuli than what is possible in herbal form. When the remedy matches the symptom profile, Chamomilla has the ability to treat conditions such as asthma, behavioural problems, colic, teething difficulties or toothache, diarrhoea, painful menses (periods), hot flushes, osteomyelitis, middle ear infections, premenstrual syndrome. Very irritable mood; snaps and snarls; will not speak or answer civilly; mad. Exceedingly sensitive to pain, which makes her mad: numbness alternates with, or attends, the pains; sweats with the pains. Excessive uneasiness; anxiety; agonized, tossing about; will only be quieted by carrying the child about. High fever with sweating, especially on the head; thirsty; one cheek red and hot, the other pale and cold. Dentition diarrhœa; green stools, foul odor like rotten eggs, much colicky pain, abdomen bloated. Cough dry < at night, when asleep, from tickling in throat pit; < cold weather and every winter. Especially adapted to children and nervous, hysterical women. Violent rheumatic pains drive him out of bed at night; compel him to walk about. Burning of soles at night; puts feet out of bed. Anger, with rage, violence and heat. Weeping uneasiness ; the child wants different things, and repels them when given to him. The child cries and wants to be carried on the arm. Seeks a cause for quarrel. Peevishness and ill humor ; taciturn absence of mind. Over-sensitiveness of the nerves ; (pain is insupportable, drives to despair). Over-sensitiveness of the senses, (especially from coffee narcotics). Great, prostrating debility as soon as the pain begins. Convulsive twitchings in the limbs. Extreme sensitiveness to pain, with great irritability. Over-sensitiveness to the open air, and aversion to being in the wind. At night, tearing (rheumatic) pains in the limbs, with sensation of numbness. The pains are worse at night, and are accompanied by thirst and heat. Aggravation at night ; from anger, (colic) ; after taking cold ; while lying down ; during perspiration ; during sleep. Amelioration while fasting ; from bending the head backward ; after perspiration ; on rising. Omits words when writing or speaking. Confusion of the head, with transient, painful pressure on the eyes, in the afternoon. Dullness of senses, diminished power of comprehension. Imagines he hears the voice of absent persons, at night. Child cries, quiet only when carried. Whining restlessness ; the child wants this and that, which when offered are refused, or pushed away. Cannot endure being spoken to, or interrupted while speaking, especially after rising from sleep. Great impatience, everything seems to go slowly. The paralytic sensations are always accompanied by drawing or tearing pain, and the drawing or tearing pains rarely occur without the paralytic or numb sensation in the part. Muscular or articular rheumatism, with great nervous excitability ; also when pains are erratic, worse knees and ankles ; numbness afterwards. They drive him out of bed and compel him to walk about. Children. Light or brown hair, nervous, excitable temperament. Adults ; even persons with arthritic or rheumatic diathesis.